Administrators who run local Head Start Programs understand what it means to have the numbers work against you. In the 2013 Sequestration that came as a result of the Congressional budget showdown, administrators were forced to reduce Head Start budgets by more than five percent. While that may not sound like a lot to those on the outside, between food purchasing for Head Start, administrative costs, office supplies, janitorial supplies and all of the programs offered within the program, that five percent amounted to a lot. In the face of the budget cuts, some of the local Head Start Programs were forced to shut down or reduce the amount of children and families that they were able to support. However, many administrators across the country took the attitude of working smarter and not harder to find new ways to accommodate the more than five percent shortfall without sacrificing staff, students, family programs or having to shut down all together. They started by reducing food and supply costs through free menu and nutrition services offered by FoodSource Plus and they expanded further by cutting costs for other supplies to make up the difference between the Sequestration cuts and what they needed to stay open. The free services at FoodSource Plus allowed administrators to save between 10-35 percent on their annual spending on food purchasing for Head Start without compromising nutrition and food quality. The free menu and nutrition services offered by FoodSource Plus helped administrators identify food waste within their organization, learn more about portion control and healthy alternatives to more expensive and costly purchases. Through the guidance of the team members at FoodSource Plus and the desire of each Head Start Program’s administrator to meet the budget shortfall, they were able to change the way that they handled purchasing, from inventory checking to the amounts ordered and the way things were handled when they arrived on-site. The FoodSource Plus program begins with a complete audit and assessment of the program’s food purchasing, inventory and waste. This is in an effort to reduce Head Start budgets with regard to over-ordering, ordering products that aren’t getting eaten, serving the wrong size portions and other potential issues. The team works with Head Start Programs to devise a menu that can be used to provide quality nutrition to the children and their families that will help them stay within the reduced budget. Then they import the menus from Head Start Programs into the NutriSource program, which links them to the USDA database and the order guides used within the FoodSource Plus program. This provides an accurate analysis of the nutrition value for all of the food that is being served on-site as a part of the free menu and nutrition services. A complete cost analysis is also provided for each item and every meal that is on your program’s menu. This aids in budgeting as well, revealing costs for every choice that is served. In addition, the NutriSource program calculates the needs of the program, both in the short term and in the long term, advising food purchasing for Head Start for the week, month or for any time period that is requested. This allows administrators to order some items in bulk to reduce costs and to plan spending for a shorter or longer period of time as-needed. Just enter in the number of portions you need for each item on your menu, and the program will calculate your shopping requirements. It prints out a purchase order that can then be emailed or faxed directly to the vendor. Another way that Head Start Programs can save through the FoodSource Plus free menu and nutrition services program is through the power of group purchasing. 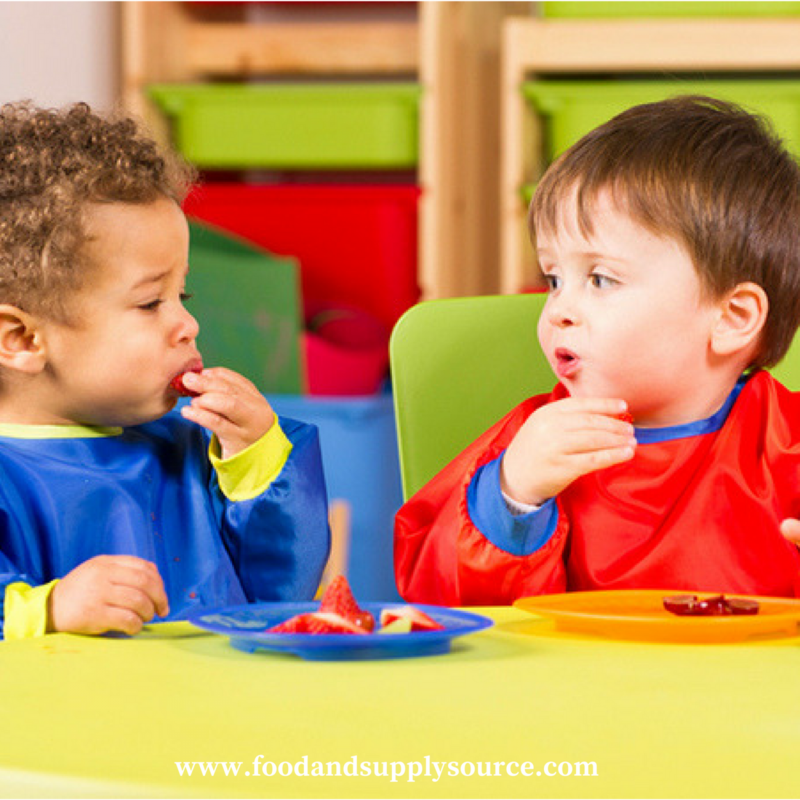 FoodSource Plus works with hundreds of vendors all across the country to get the very best price available on the food items that Head Start Programs and other human services programs need on a daily basis. Discounts that would normally go to large school districts or organizations can now be shared with administrators to reduce Head Start budgets as a direct result of purchasing power through the FoodSource Plus program. Vendors are pre-vetted to ensure quality delivery of the food and other supplies that you need most. In addition, FoodSource Plus helps Head Start Programs to implement practical purchasing procedures and systems that are designed to help management to make intelligent, cost-effective decisions with regard to their food and supply purchasing. As a result, food purchasing for Head Start administrators and kitchen staff will be more streamlined, requiring less staff attention and time spent laboring over menus and nutritional data, giving employees more time to focus on preparing quality food that participants will enjoy. To find out more about how FoodSource Plus can help with food purchasing for Head Start Programs through analysis, management, free menu and nutrition services, give us a call at 508-336-6615 or visit our website and use our online contact form. Our staff can provide you with more information about the services available to reduce Head Start budgets and can set you up with a free cost analysis to get you started. Together we can reduce spending and prepare Head Start Programs to be better equipped the next time a budget cut or government shutdown threatens the valuable community services Head Start provides.